Today is the 24th day of For a Single Purpose at 32auctions.com/jbwrshppaintings . Yes, it has been quite a ride! I have all of you to thank for making the Men in Authority series and Worship painting series a success. This following series is one of my passionate, especially since I could relate at that time….being single. Now there is nothing wrong with being Single, other than what we think; freedom, and doing whatever we want without reporting it to anyone(unless you have children), sleep late, and for many learning to be our true selves. Well to tell you the truth, not many of us know our true selves, because God is not in the picture. We all have a purpose while living on this earth and it is important that we as believers seek God to fulfill our purpose. The overlaying theme is to basically trust God and not lean on your own understanding; Proverbs 3:5. The name of this series appropriately entitled “For a Single Purpose” is what God did in using willing vessels to accomplish His will and purpose. All of these people at the time, were single people, they were not married yet at the time God called them or are either widows or prostitutes. No matter the circumstance, God used them because they believed His Word and as a result accomplished not only fulfilled their desires but ultimately gave them a purpose and within that purpose is to glorify God. Like the Men in Authority series, the nature of this project is tripartite, meaning the same theme was completed in 3 different ways and mediums. There are 11 characters in all, most of them from the Old Testament and a few big names. However, in this auction, there are only 10 characters shown and not all of characters are shown in 3 different ways based on the voting results. As usual, I enjoyed making this series because the process made the characters alive and something we can relate to in this time of age. Featured image of the day…. Daniel III (2013). 28″BY 44″ Collage on plyboard. 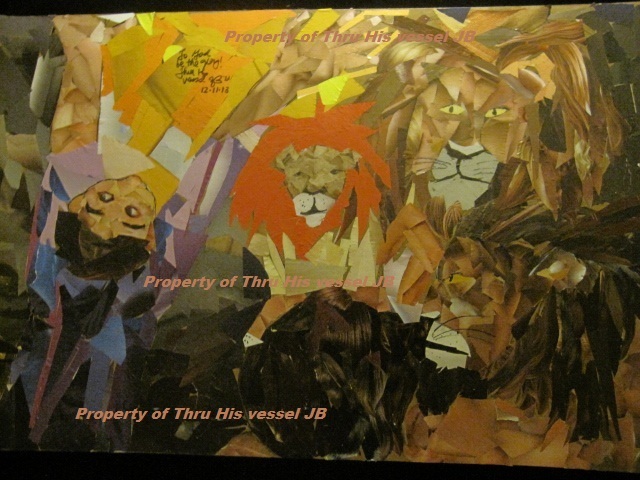 Thru His vessel JB. Yes, as you can see, it is Daniel in the lion’s den. Daniel has gone through a lot, yet the whole time, Daniel never lost his trust in God. He was bold and knew that God delivers. It helped that Daniel talked to God three times a day, and it shows that Daniel was a friend of God’s. We as believers cannot be a friend of God’s if we do not spend time with Him. It is apparent that Daniel spent lots of time and knew God would never fail him, when He delivered angels to the lions den to shut the lions’ mouths. I depicted Daniel as praising the Lord before and after. Today and only today, the highest bidder can get this piece for a minimum of $576 at 32auctions.com/jbwrshppaintings. In addition, get a free commissioned portrait, courtesy of yours truly to be placed in the 2016 art show. I thank you foryour support!